These 6 best engine additives, are so because they end 21 known engine problems, doing so by cleaning and reconditioning your 6 dirty, trouble-causing fuel system, fuel injector, air intake, combustion, smog reducing, and oiling system negatives. 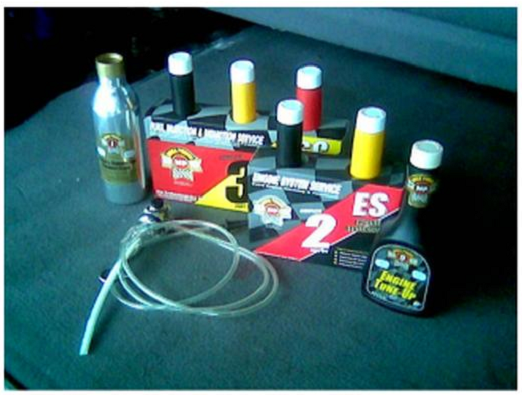 The best engine additives clean all 6 trouble-causing engine areas. That is what our Slo-wear Engine Treatment does for your engine. Installed easily in 2 steps: Step One - cleans emission system, air manifold system, fuel system fuel injector cleaner, and exhaust system cleaners - Benefits you with longer engine life, ending of valve tap, removing of acids, and chemically slowing engine wear out - and transmission and radiator wear out - if you service them with Slo-wear. [Silver metal can/hose for mechanics, not included or needed for this application]. Those are your 3 best engine additives for the top of your motor! The 3 up-front items, installed as Step 2 a week later during an oil change. Include Oil System Cleaner and Sludge Removal. And valve and valve lifter freeing cleaners and conditioners. Every engine system and part is treated. MC+ also included, fills worn spaces to the new oil, completing the treatment - and ending your particular motor problem. The 6 Best engine additives. More that just good cleaners - why use less than the best, when only the best will do! Read this review and order them below. Shipped to your door by FedEx or USPS in about 3 days. Includes directions, phone help, and money back guarantee if no improvement is noted. A quick way to end engine problems and gain years more trouble-free service - Avoids, by putting off for years, those costly $3500 overhauls that you want to avoid now! Order now! End this worry! Order Slo-wear Engine Treatment now! 6 items listed. Just $95 total. Regular price $125. Save $30. offer subject to end. Protect engine transmission and radiator systems. Good for 4 years. Order Slo-wear Engine Transmission Radiator Treatments now! 12 items. Just $150 total. Regular price $210. Save $60. Shipped to your door by FedEx or USPS in about 3 days. Includes directions, phone help, and money back guarantee if no improvement is noted. A quick way to end engine problems, prevent transmission and cooling system problems [meets service requirements], and gain years more trouble-free car service - Avoids those costly $3500 overhauls. Order Slo-wear Engine Transmission Radiator Treatment now! 12 items. Just $150 total. Regular price $210 Save $60. Slo-wear will do the job - when otherwise, a costly, $2000+ engine tear down is the other way. Order these 6 best engine additives now! You car and your budget needs them! Just how strong are these products, from Mega Power? See why these are the best engine additives for yourself, here.